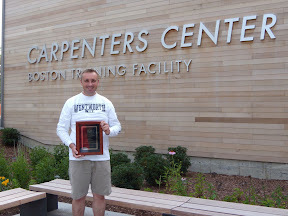 Twenty-nine union carpenters graduated from the Arioch Center at Wentworth Institute of Technology with and Associate's Degree in Building Construction Management (read more here). Graduate Eamonn Murphy, a twelve-year member of Local 33, was recognized as the Outstanding Associate Degree Student for the 2009-2010 academic year. "I am extremely honored to be recognized as the Outstanding Student," said Murphy. "As I look back, however, I realize that my fellow students are all outstanding students. We encouraged each other and worked together collaboratively in accomplishing this goal." Murphy first joined the Carpenters Union as an apprentice in 1998. When the opportunity arose to enroll in the Construction Management program at Wentworth, Murphy was enthusiastic about being able to continue his training and further advance his career. "Obtaining a Construction Management degree from Wentworth was the logical choice in expanding my knowledge of the construction industry, and the program certainly provided that for me." Murphy, along with many of his classmates that just received their Associate's Degree will be continuing on in to the Bachelor's Degree program. Wentworth ran a student profile of Brother Murphy on their website.